Mile-Maker Ocean Passage from the North Sea to the Cape Verde Islands. 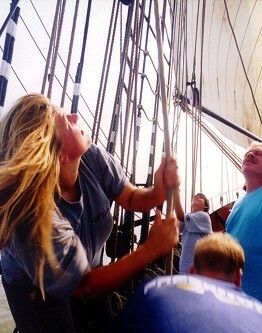 Sailing from the North Sea, through the English Channel, then out into the Atlantic for a Blue Water Passage. 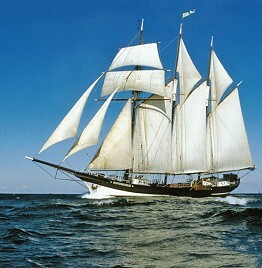 A mile maker is a voyage that is meant to bring the ship from point A to point B as soon as possible. Depending on the weather it is possible that the duration of the milemaker is two days longer of shorter than expected. You pay a fixed price for your participation, regardless of the duration. This description is meant to give you an impression of how a voyage could look like. Depending on wind and weather conditions the travel plan could be altered, however we always try to sail as much as possible. Rotterdam is the largest seaport in Europe. It was the world's busiest port until 2004 when it was surpassed by Shanghai. The city sits on the banks of the river Nieuwe Maas, at the confluence of the Rhine and Meuse rivers. The name Rotterdam refers to the dam in the Rotte river. The North Sea is a marginal body of water of the Atlantic Ocean located between Great Britain, Scandinavia, Germany, the Netherlands, Belgium and France. Waters flow east to west into the North Sea through the Skagerrak Strait, an outlet to the Atlantic Ocean from the Baltic Sea. The English Channel, often referred to simply as the Channel, is an arm of the Atlantic Ocean that separates southern England from northern France, and joins the North Sea to the Atlantic. It is about 350 miles long and varies in width from 150 miles at its widest to 21 miles in the Strait of Dover. There are several major islands in the Channel, the most notable being the Isle of Wight off the English coast, and the Channel Islands, British Crown Dependencies off the coast of France. The Isles of Scilly off the far southwest coast of England are not generally counted as being in the Channel. The coastline, particularly on the French shore, is deeply indented; several small islands close to the coastline, including Chausey and Mont Saint-Michel, are within French jurisdiction. The Cotentin Peninsula in France juts out into the Channel, and the Isle of Wight creates a small parallel channel known as the Solent in English waters. The Celtic Sea is to the west of the Channel. For centuries, navigation between England and France was by ferry. Today the predominant crossing is the newly created "chunnel", a high speed underground rail line. The Bay of Biscay is a gulf of the northeast Atlantic Ocean located south of the Celtic Sea. It lies along the western coast of France from Brest south to the Spanish border, and the northern coast of Spain west to Cape Ortegal, and is named in English after the province of Biscay, in the Spanish Basque Country. Parts of the continental shelf extend far into the bay, resulting in fairly shallow water in many areas and thus cause the rough seas for which the region is known. The Bay of Biscay is home to some of the Atlantic Ocean's fiercest weather. Vigo is a busy commercial port. From atop Mount Castro you can see the estuary, the coastline and the city, a great spot from which to take photos. Visit the Park of Castrelos, Vigo's largest urban park covering over 5 acres. The park houses the Quiñones de León Palace, now the municipal museum, surrounded by beautiful English- and French-style gardens. A huge variety of trees and plants border the River Lagares, and the park features an open-air auditorium, making use of the terrain's natural slope, where concerts and festivals are held in the summer. Be sure to visit Santiago de Compostela, an hour from the port. View Obradoiro Square and explore the 15th-century Hotel of the Reyes Catolicos, built during the reign of the Catholic Kings with a blend of Renaissance, Gothic and Baroque styles. Just across the square is the impressive cathedral, where at the Jubilee Door pardons are dispensed in Jubilee Year. Santa Cruz de la Palma is a municipality in the eastern part of the island of La Palma in the province of Santa Cruz de Tenerife of the Canary Islands. It is located along an old lava flow coming out from the Caldera, an inactive volcano just south of the city. The population is approximately 16,000. Founded in 1493, it was an important port on the route between Europe and the American colonies and was once the third largest port in Europe. The town's architectural heritage (in the Old Town) can be seen in its stately colonial style houses on cobblestone streets. This peaceful place has many cultural attractions including the insular Museum with its remarkable collection of paintings and art, as well as the Chico and Circo de Marte theaters. Sal is known as the Sunniest Island. When flying in it seems as if you are landing on a golden pearl of sand in the middle of a turquoise-blue ocean. For many years, the island was a center for salt mining, which is also where the name Sal - salt - comes from. However, the salt is almost only for local use and for tourists now. The city of Santa Maria has developed in a lively way. With its many miles of beaches that are up to 500 feet wide, Santa Maria offers ideal conditions for a classic beach holiday. The landmark of the town with its small restaurants, stores and little pastel-colored houses is undoubtedly the weigh house on the old harbor quay, where salt was weighed in years past, and now is the site of souvenir shops. You can still see fishermen when they bring in their catch and clean it at the harbor quay, just as in the past.